News via Alex Ross of an online campaign to put Pete Seeger back on the Billboard chart echoes another campaign fifty years ago that brought together the two musicians seen above. Seeger was convicted of contempt of Congress six years after his 1955 appearance before the House Committee on Un-American Activities. After his conviction and before his successful appeal, Seeger obtained the court’s permission to tour England. In 1961 he played at London's Royal Albert Hall in a concert promoted by the British “Pete Seeger Committee” which had been formed to support the embattled musician; Paul Robeson was president, the great ballad singer Ewan MacColl was chairman, and the sponsors were Doris Lessing, Sean O’Casey and none other than Benjamin Britten. There is no mention of Britten's support for Seeger in Humphrey Carpenter's definitive Benjamin Britten: A Biography but it is detailed in David Dunaway’s invaluable biography of Pete Seeger. We do not know if Britten attended the London concert and my header image is, of course, a montage. 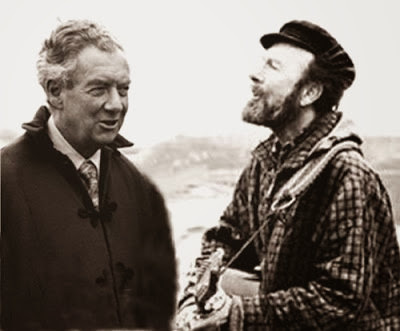 But even though Seeger and Britten seem an unlikely combination there is a music connection: Britten set and Seeger recorded the folk song The Water is Wide, also known as O Waly, Waly. More on that 1961 Pete Seeger committee here and the other Mrs Seeger is here. Dear Pliable: Your montage is good enough that it's probably going to be used as gospel evidence for Britten and Seeger's meeting in England on Google images in the future. You have been warned. They're oddly similar characters in some ways, natural musicians who were also natural political radicals to the core, even though Benjie did seem to love his royalty. It's a cool thing that people want to give Pete Seeger the limelight.